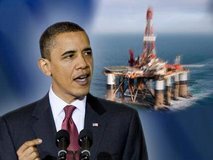 Facing continued public unhappiness over gas prices, President Barack Obama is directing his administration to ramp up U.S. oil production by extending existing leases in the Gulf of Mexico and off Alaska's coast and holding more frequent lease sales in a federal petroleum reserve in Alaska. Obama said Saturday that the measures "make good sense" and will help reduce U.S. consumption of imported oil in the long term. But he acknowledged anew that they won't help to immediately bring down gasoline prices topping $4 a gallon in many parts of the country. His announcement followed passage in the Republican-controlled House of three bills - including two this week - that would expand and speed up offshore oil and gas drilling. Republicans say the bills are aimed at easing gasoline costs, but they also acknowledge that won't be immediate. The White House had announced its opposition to all three bills, which are unlikely to pass the Democratic-controlled Senate, saying the measures would undercut safety reviews and open environmentally sensitive areas to new drilling. But Obama is adopting some of the bills' provisions. Answering the call of Republicans and Democrats from Gulf Coast states, Obama said in his weekly radio and Internet address that he would extend all Gulf leases that were affected by a temporary moratorium on drilling imposed after last year's BP oil spill. That would give companies additional time to begin drilling. The administration had been granting extensions case by case, but senior administration officials said the Interior Department would institute a blanket one-year extension. New safety requirements put in place since the BP spill also have delayed drilling in Alaska, so Obama said he would extend lease terms there for a year as well. An oil lease typically runs 10 years. Lease sales in the western and central Gulf of Mexico that were postponed last year will be held by the middle of next year, the same time period required by the House. A sale off the Virginia coast still would not happen until 2017 at the earliest. But Obama said he would speed up environmental reviews so that seismic studies to determine how much oil and gas lies off the Atlantic Coast can begin. To further expedite drilling off the Alaskan coast, where such plans by Shell Oil Co. have been delayed by an air pollution permit, Obama said he would create an interagency task force to coordinate the necessary approvals. He also will hold annual lease sales in the vast National Petroleum Reserve on Alaska's North Slope. Officials said the most recent sale was last year, but that they had not been held on any set schedule. Republicans dismayed by the lack of progress in Shell's drilling have drafted legislation to exempt drilling off Alaska from air pollution laws. House Natural Resources Committee Chairman Doc Hastings of Washington, sponsor of the legislation, said it was "ironic" that Obama "is now taking baby steps in our direction" after the White House and congressional Democrats criticized the bills. "The president is finally admitting what Republicans have known all along, that increasing the supply of American energy will help lower prices and create jobs," Hastings said. Obama also called on Democrats and Republicans to vote to eliminate billions in taxpayer subsidies to oil and gas companies. In the weekly Republican message, Alabama Rep. Martha Roby said it's time for Washington to get serious about the challenges facing the country, including straightening out its finances and tackling the gas price issue. She praised the House for passing measures to expand domestic energy production "because when we're talking about energy, we're talking about jobs." "The greatest threat to our economy, job creation, and the future of our children is to do nothing," Roby said. "We have to act. It is what we were sent to Washington to do."